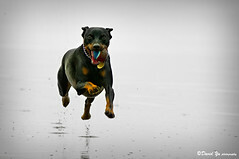 When the dog pays attention, a walk in the park or a training exercise are easy, fun and rewarding. When the dog spends the majority of the time looking for anything else to do besides focusing on the human, the same experiences can be frustrating and discouraging. There is a striking difference between different people’s ability to get their dog’s focus and attention. It’s about how interesting and inspiring they are to be around. The confidence level of the person holding the leash plays a determining role in the dog’s behavior. While I was working with men and women in prison, their individual differences and their effects on the dog’s reactions were quite evident. The dogs were often passed from one handler to another for generalization purposes of the service dogs in training. With one handler a dog was unresponsive and distracted, almost to the point where it was hard to tell she had received any training. With another handler, the same dog would be focused, alert, on task and showing a very high level of skills. In all cases, the handlers had clickers and treats. The main differences: the handler’s attitude, confidence and skill level. When working with dogs, what we’re trying to do is to influence their behavior one way or another. Like a teacher or a leader, our goal is to inspire the dog to want to pay attention to us and interact with us. Although using the right treats and good timing is critical in the process, there are more subtle ingredients that can make the difference in the dog’s level of interest. Dog professionals need to have a strong understanding of dog behavior and training of course, but an even bigger and more challenging part of their job is to know how to communicate with the owner. Helping others develop confidence and trust in their ability to handle their dog is a key element to their success. Walk with purpose. Nobody would want to follow someone who’s just walking without a goal. Even if it’s on a straight line, slowly and for a few feet, walking with intention is much more inspiring than strolling aimlessly. Stand straight, shoulders back and walk with confidence. Confidence inspires confidence. The more anxious and hesitant we are, the more anxious the dog. When a dog is worried that the person cannot handle the situation, they will tend to be on the lookout for potential problems, thus more distracted. Use proper equipment. There are plenty of tools on the market today that provide immediate control to owners who struggle when walking their dog. Trusting our ability to manage even the most difficult situations plays a key role in our confidence level. Act as a guiding and protecting parent or teacher. 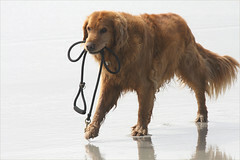 Being on leash, dogs have lost the ability to choose where to go and what to do. Remaining calm and providing the dog with some direction will encourage him to pay attention to you. It’s critical to stay relaxed, patient and calm. Relax the arm that holds the leash and folding the leash to make it the perfect length for both handler and dog. It’s also best to keep our arm down along side of our body or folded with our hand on our belly button. Avoiding nervously clamping on the leash while raising our arm up to your chest is also important. and making different sounds are all ways to keep the dog’s focus on the handler. The key is to learn when, what and how to do it at the right time. This point is often the most challenging for most beginners. ‘Fake it ‘till you make it’. It’s so difficult to feel confident when still challenged with figuring out how to hold the leash, deliver treats, manage the dog around others, etc… It takes a certain level of knowledge and experience to truly develop the confidence that we know what we’re doing. Until then, the best approach is to just pretend that we do and act accordingly. 1 Pings/Trackbacks for "Confidence – the key ingredient to successful training"